Instead of being the passive consumer of a unique travel experience we help you learn how to make those experiences happen for yourself. At the same time we go on a genuine trip of exploration, combining learning with an expedition. Different environments will offer opportunities for different experiences and the development of new skills. So, this may not be the website for you. Really. We are not a Tour company. We don’t offer cheap thrills. Or even expensive thrills. We don’t keep you separate from the real nitty-gritty of travelling. Every trip we make is different, in fact, unique. We work with nomads and natives, many of whom don’t speak a word of English or very little. 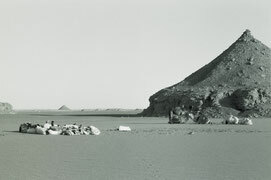 Our current focus is on desert expeditions in Egypt where we go into unvisited areas of the Sahara travelling on most expeditions with camels - not sitting passively in 4x4s speeding across the sand and cut off from the environment. Where we have to use 4x4s in the desert to get to an area of exploration that is too far to reach with camels - such as the Gilf Kebir - we will explore by foot on the ground after reaching the exploration area. We believe that travel is about the experience, not just notching up another 'sight' or far off destination. But experience comes at a cost - learning something new. That's why at The Explorer School we offer expedition learning experiences, which is a cumbersome way of saying you are actively encouraged to participate and learn new skills, both ancient and modern, while making a genuine journey of exploration. These journeys are not packaged rides through scenic terrain; for example, our desert expeditions are genuine trips into the little visited and unrecorded areas of the desert. 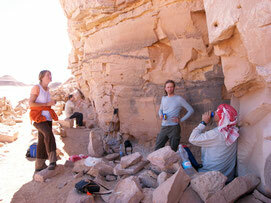 We simply don't know what we may discover - old camel routes, nomad graves, rock art or stone age encampments. What we do know is that you will have the experience of a lifetime that will also enable you to make similar trips alone. We don't want to make you dependent on commerce to explore the world - we aim to liberate you through giving you skills that we ourselves have acquired over time. 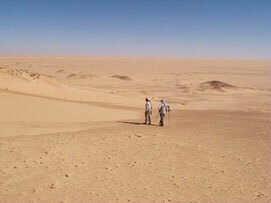 Our desert expeditions are in a very special place - the super arid region of the Sahara desert in SW Egypt. On every trip we’ve made so far, and we’ve made a few, we have never encountered another human being, let alone a tourist, either during our 10-14 day desert expeditions or on our recent 28 day expedition in the great sand sea. That’s right - none. Call it the zero option. From us, your intermediary guide/teachers/navigators you will learn all you need to know to make such journeys on your own. We don’t aim to enslave you with ignorance, we aim to liberate you with knowledge. 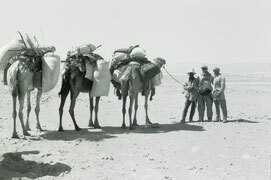 Next time we might meet you out there with camels of your own. No people? So what do we see out there? Sand. Quite a lot of that. Stone age tools that date from 400,000 to 5,000 years ago. Rock carvings of animals such as giraffe, that disappeared from the desert during the last wet spell over 7000 years ago. Hieroglyphs carved into rock faces after mysterious Pharonic excursions into the desert. Hut circles and burial places. Fennec foxes, gerbils and gerboas. Falcons, lizards, locusts and the odd beetle. No flies and no mosquitoes. Like people, once you leave the Oasis there are zero parasites on the human being. The Desert is the cleanest place on earth. Water mountains and spring mounds and dry lakes - the remains of the wet periods. Grinding querns and pestles. Hills and canyons and eroded outcrops of towering rock. Quite simply one of the most beautiful and untouched places left on Earth.